This entry was posted in American Literature and tagged Elizabeth Hardwick, NYRB Classics, Robert Lowell, Sleepless Nights by Simon Lavery. Bookmark the permalink. Thank you for this review – I’ve had Sleepless Nights on my shelf for some time but I’ve been wary about reading it, an instinct your comments confirm. I don’t do that well with meandering, plotless novels, however elegant the prose. 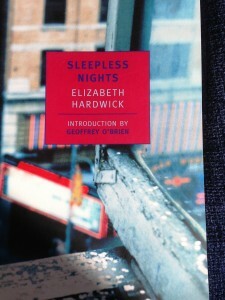 But Hardwick is so smart, and I admire her criticism so much, that I feel I ought to at least try. Maybe in the summer when I’m at more leisure and the qualities you describe won’t make me so impatient! Have a good trip. I’m gratified to hear you have reservations too about plotless novels. Flight was fine, thanks. Nearing London now on train – sun shines at last! Thanks for alerting me to this review, Simon – it’s very useful. I can understand why Adler’s Speedboat came to mind as it sounds as if there are a number of similarities between the two. Based on the quotes you’ve selected (and your comments over at mine), Hardwick’s prose does feel more lyrical than Adler’s. I suspect I would like the reportage aspect here — one of the aspects I particularly enjoyed in Speedboat — but I’m less sure about the poetic/lyrical style. There was something rather cool and detached about Adler’s prose that worked so well within the context of Speedboat’s structure and themes, but I don’t know if I’d engage with Hardwick’s style in quite the same way. (Not in a fragmentary, largely plotless novel anyway.) Have you read anything else by Hardwick? NYRB have another couple of her books on their list – a collection of short stories and a book of essays on women writers. Good to hear from you again, Jacqui. I also found Adler’s novel more substantial; I didn’t feel inclined to explore EH further at this point. NYRB does put out some good titles!